Three Star Leadership | Wally Bock | Mini-Review: Why Do So Many Incompetent Men Become Leaders? 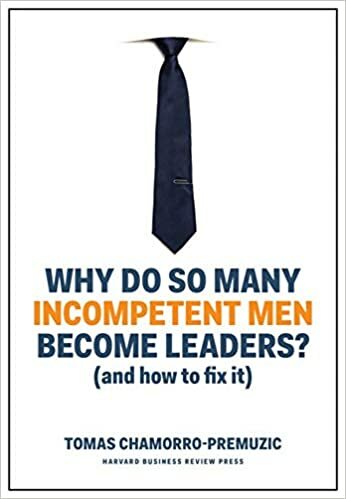 Mini-Review: Why Do So Many Incompetent Men Become Leaders? Why Do So Many Incompetent Men Become Leaders? by Tomas Chamorro-Premuzic may win the award for most provocative title ever. Don’t use the title as an excuse to pass up the book. It’s not another entry in the gender wars. The book is about improving the quality of leadership in business. The popular perception is that an awful lot of bosses are not effective. Many are downright toxic. Here the popular perception is correct. In Now You’re the Boss, I described a review of twelve studies that showed 30 percent to 60 percent of managers don’t do an acceptable job. Even if “terribleness” is evenly distributed across genders, there will be more terrible male bosses than female ones because there are more men leaders than women leaders. If Dr. Chamorro-Premuzic stopped there, the book would be interesting, but not significant. Luckily, he covers a lot more about how we select leaders. You’ll read why we often mistake confidence for competence and how charisma clouds our judgement of how leaders perform. The author describes “The Female Advantage” and how those behaviors are not limited to women. Most interesting to me was his discussion of why it’s so hard to measure a leader’s impact. Chamorro-Premuzic makes the case that if we want to get more effective leaders, we must change the way we choose people for leadership roles. He wrote a well-argued and lucid book to help all of us solve that problem. Read Why Do So Many Incompetent Men Become Leaders? by Tomas Chamorro-Premuzic if you want to increase the number of quality leaders in business and elsewhere. What’s the fastest way to learn the big ideas from a great business book? Book summaries. Check out summaries from The Business Source, where you can watch, read, or listen to the big ideas from a great book in under 20 minutes.